BLVD 16 was located inside of the Palomar Hotel. The Palomar, when I stayed there, was fantastic. The staff was very friendly and attentive. Fat Bruce Lee, myself, and our Australian colleague (Jet Lag) hoped that this would translate into our dining experience. The young woman, who waited on us, was friendly and knowledgeable. She was well-versed in both the ingredients and the preparation of our burgers--that was beyond refreshing. We also had the good fortune of picking a day when the Executive Chef, Simon Dolinky, was in the kitchen. The deck was stacked in our favor. 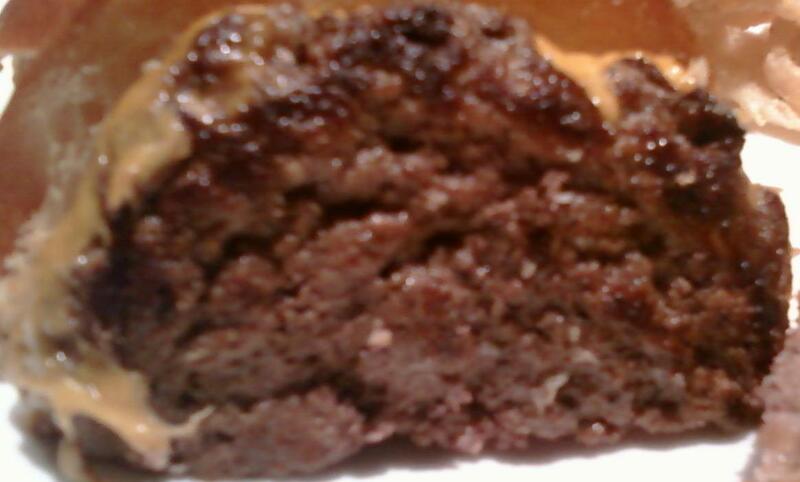 The Beef: The usual...80/20 medium ground chuck. The beef came from Brandt Beef, and while it was a humble chuck, it delivered a strong beef flavor on the front end. It was lacking those bloody, iron notes required to carry the dish home. Chuck is chuck--it can only take a dish so far. To create a truly special burger, sirloin, rib, and other bold and interesting cuts need to make their way into the grind to create depth of flavor and texture. The Sear: The sear was strong. I requested a hearty sear, and that's what I got. They did this on a griddle or in a pan. The Preparation: They nailed the Medium request. The collagen from the chuck melted nicely through the cooked rind of the burger patty, and the inside remained pink and moist. The cheeseburger served by BLVD 16 was a $10 lunch-sized portion, and the smaller size of everything (compared to the $14 dinner burger) was absolutely appropriate to a lunch. The Bun: Boo--It was one of those uninteresting, dry, flaky brioches that the La Brea Bakery sends out for the purposes of sabotaging perfectly good burgers. The La Brea Bakery is generally very competent, but this particular style of bread is their Achilles' heel. We've seen this bun before--it was like a bland croissant, and it robbed the burger of moisture without providing any value in terms of flavor and texture. Had we used the onion marmalade/compote and the onion rings, the moisture may have been sourced elsewhere, but that's not how we roll. Bun...Meat...Cheese. This was the same bun that was used at Literati with similar results. 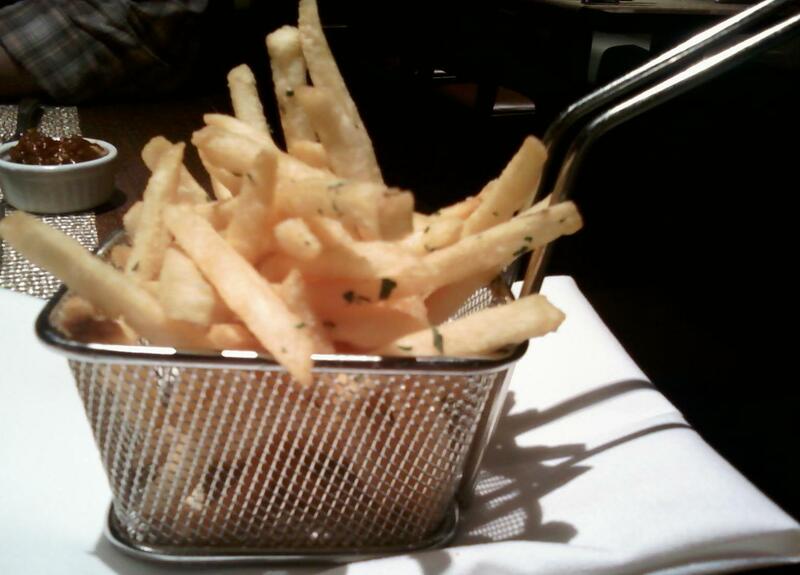 The Seasoning: A peppery blend of something flavorful coated the outside. The inside was relatively bland. 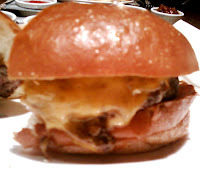 The Cheese: A ho-hum Cheddar of unknown origins--it really didn't add any discernible flavor or texture to the burger. Frankly, its proximity to the dry bun ruined its chances of providing the expected, melted cheese goodness in terms of mouth feel. 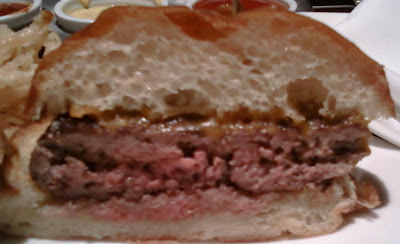 Meat to Bun Ratio: The bun was mercifully small, so the meat in this burger almost, but not quite, overpowered the bun. Still hands were dry at the end, so it was just right. The flakiness of the bun was misleading, since it collapsed but did not fall apart--a big bun turned into a small one that did the trick in terms of containing the burger and it juices. The Fries: Crisp, crisp, crisp--the fries were fantastically crisp. They were perfectly seasoned with salt and herbs from the rooftop garden (Is it really wise to eat plants grown in the middle of LA?). The were wonderful! The Value: At $10, this cheeseburger was on the high side, and sides were extra. Higher quality beef would have brought the value into a more tolerable range. Burger Review : BLVD 16 delivered a perfectly prepared burger, which was cooked with great care and skill. Sadly, the bun and the pedestrian choice of beef failed to showcase the skill that was clearly present in the kitchen. This was about as good as Chuck could get--Chuck only goes so far, though. Still, this was a well above average burger.